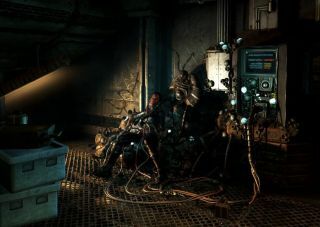 Frictional Games has revealed the system requirements for Soma, the sci-fi horror-fest that will be out next month. It also posted a new "Behind the Music" video in which composer Mikko Tarmia plays an instrument that looks like it belongs in the Star Wars cantina scene and explains how it will make the game even creepier. The video is brief but interesting, especially when Tarmia whips out the bizarre space saxophone and demonstrates how it's used. The initial sound is "pretty good," he says, but passing the signal through a delay unit and a reverb changes it into something dramatically different, and much more akin to the sort of noise you don't want to hear behind you in a dark room. The low-end minimum requirement opens the door to just about any reasonably-equipped gamer who wants to suffer through Soma, and even the recommended spec isn't particularly onerous. Soma comes out on September 22, but preorders may be placed now at Steam or GOG. If you haven't already, you should also take a look at our July hands-on with the game, in which Andy (the other one) declares that Soma is "shaping up to be a pretty special horror game."